Chelsea coach Maurizio Sarri has revealed what he and Jurgen Klopp was discussing during the game at Stamford Bridge two weeks ago. One would say both Sarri and Klopp has a lot of respect for each other and the Chelsea coach has expressed his admiration for the Liverpool coach. 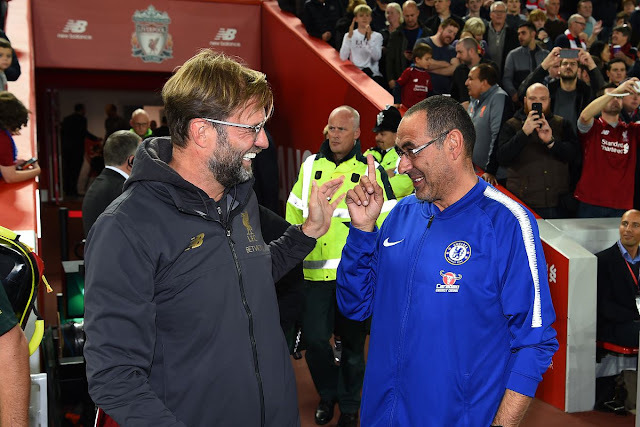 During the game at Stamford Bridge, both Maurizio and Klopp were seen discussing on the sideline and the former Napoli manager has now revealed what they were discussing. Speaking with Corriere dello Sport, Sarri revealed Kloop told him he was having much fun even when his team was losing. The next time Liverpool and Chelsea meet again will be on the 13th of May 2019. A match which might determine who wins the league.